Staphylococcus aureus secretes numerous virulence factors that facilitate evasion of the host immune system. Among these molecules are pore-forming cytolytic toxins, including Panton–Valentine leukocidin (PVL), leukotoxin GH (LukGH; also known as LukAB), leukotoxin DE, and γ-hemolysin. PVL and LukGH have potent cytolytic activity in vitro, and both toxins are proinflammatory in vivo. Although progress has been made toward elucidating the role of these toxins in S. aureus virulence, our understanding of the mechanisms that underlie the proinflammatory capacity of these toxins, as well as the associated host response toward them, is incomplete. To address this deficiency in knowledge, we assessed the ability of LukGH to prime human PMNs for enhanced bactericidal activity and further investigated the impact of the toxin on neutrophil function. We found that, unlike PVL, LukGH did not prime human neutrophils for increased production of reactive oxygen species nor did it enhance binding and/or uptake of S. aureus. Unexpectedly, LukGH promoted the release of neutrophil extracellular traps (NETs), which, in turn, ensnared but did not kill S. aureus. Furthermore, we found that electropermeabilization of human neutrophils, used as a separate means to create pores in the neutrophil plasma membrane, similarly induced formation of NETs, a finding consistent with the notion that NETs can form during nonspecific cytolysis. We propose that the ability of LukGH to promote formation of NETs contributes to the inflammatory response and host defense against S. aureus infection. Staphylococcus aureus is a leading cause of bacterial infections worldwide and renowned for causing a diverse clinical spectrum of disease. The success of S. aureus as a pathogen is facilitated by production of a litany of virulence factors that promote evasion of the host innate immune system. S. aureus secretes a wide range of toxins, including several leukotoxins that have potent cytolytic activity toward polymorphonuclear leukocytes (PMNs) (1). S. aureus expresses at least four two-component leukotoxins: Panton–Valentine leukocidin (PVL), leukotoxin GH (LukGH), leukotoxin DE, and γ-hemolysin. These leukotoxins consist of two polypeptide subunits that sequentially assemble and form a β-barrel pore across the plasma membrane. Although the ability of the bicomponent leukotoxins to lyse PMNs in vitro is well characterized (2–6), the impact of sublytic concentrations of leukocidins on neutrophil function and/or the overall host immune response is less clear. Indeed, previous studies showed that leukotoxins, such as PVL, may not achieve cytolytic concentrations in vivo and suggest an additional role that extends beyond cell lysis (7, 8). PVL is a potent proinflammatory toxin and elicits a pronounced inflammatory response following injection of purified toxin into the skin in experimental animal models. In addition, sublytic levels of PVL induce several myeloid cellular responses, including release of myeloperoxidase (MPO) and chemotactic factors, such as IL-8 and LTB4 (9–12), and prime PMNs for enhanced bactericidal activity (13). Recently, we demonstrated that although LukGH is cytolytic toward rabbit neutrophils in vitro and promotes inflammation in the skin, isogenic USA300 strains devoid of the toxin promoted more severe infection than did the parent strain. Although the finding suggests that LukGH may contribute to host defense against S. aureus, the mechanism underlying the ability of the leukotoxin to enhance the innate immune response is unknown. To address this deficiency in knowledge, we investigated the ability of sublytic levels of LukGH to alter neutrophil function. Human PMNs were purified from heparinized blood of healthy donors, as previously described (14), in accordance with a protocol approved by the National Institute of Allergy and Infectious Diseases Institutional Review Board for human subjects. Donors were informed of the procedure risks and provided written consent prior to enrollment. Purity and viability of purified PMNs were ≥99%. S. aureus USA300 strain LAC was cultured in trypticase soy broth (Difco, Detroit, MI) at 37°C with shaking at 225 rpm. Overnight cultures were diluted 1:200 into fresh trypticase soy broth media, and bacteria were cultured to midlogarithmic phase of growth (OD600 = 0.75). S. aureus strain SF8300ΔhlgABC/ΔlukDE/Δpvl containing the plasmid pTX-15-lukGH was used to produce and purify LukGH, as described (5). The quality of purified protein was assessed by SDS-PAGE, and protein concentration was determined by use of a BCA Protein Assay kit (Pierce Protein Research Products/Thermo Fisher Scientific, Rockford, IL), in accordance with the manufacturer’s protocol. Purified LukGH was stored in 0.2 M NaCl 30 mM sodium phosphate buffer (pH 6.5) at −80°C. LukGH-mediated PMN plasma membrane permeability (pore formation) was evaluated by ethidium bromide uptake (7, 15). To exclude cell debris, intact neutrophils were gated (during analysis) based upon typical forward scatter and side scatter characteristics. Briefly, PMNs were incubated with 0.1–5 nM LukGH for 30 min. Heat inactivation of LukGH was accomplished by incubating the protein for 10 min at 95°C. To verify that PMN membrane permeability and lysis were caused by LukGH, we inhibited cytolysis with rabbit polyclonal Ab specific for the leukotoxin H (LukH)–specific peptide sequence KDKRNVTNKDKNSC (GenScript, Piscataway, NJ). To inhibit PMN cytolysis, LukGH was incubated for 15 min at room temperature with 100, 40, or 20 μg/ml anti-LukH prior to combining with PMNs. Human neutrophil lysis was determined by lactate dehydrogenase (LDH) release using the Cytotoxicity Detection kit (Roche Applied Sciences, Indianapolis, IN), as described previously (16). Briefly, neutrophils (1 × 106) were combined with 0.1–5 nM LukGH alone or a mixture of LukGH containing 100, 40, or 20 μg/ml anti-LukH in 96-well tissue culture plates. After 3 h of incubation at 37°C, the plate was centrifuged at 1600 rpm for 7 min at 4°C, and cell supernatants were diluted 1:1 with RPMI 1640 medium (Invitrogen/Life Technologies, Grand Island, NY) buffered with 10 mM HEPES (RPMI/H) for detection of extracellular LDH, as per the manufacturer’s instructions. Freshly isolated neutrophils (400 μl; 107 PMNs/ml) were prechilled on ice in 0.2-cm gap Gene Pulser cuvettes (Bio-Rad, Hercules, CA). Cells were electropermeabilized in a Gene Pulser Xcell (Bio-Rad) using the following settings (determined empirically): 600 V and 10 μF or 800 V and 25 μF. 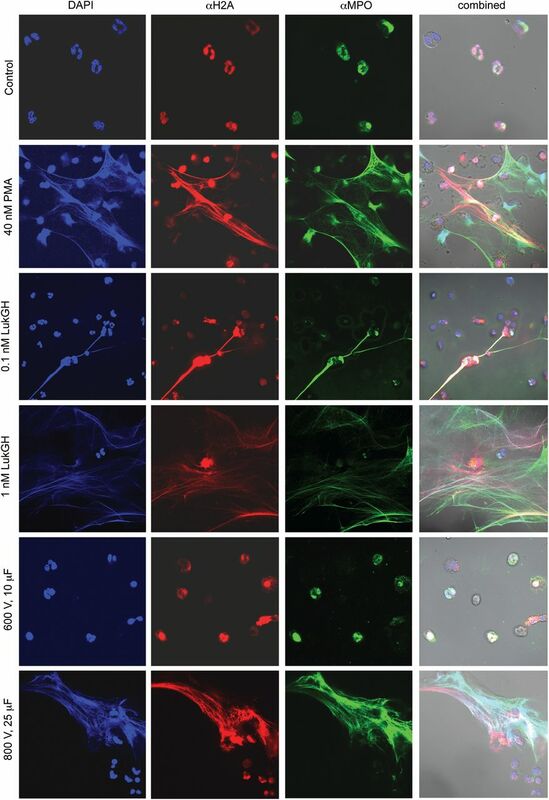 The efficiency of electroporation was confirmed by PMN permeability assays, as described above, and cells were examined visually under the microscope to monitor gross cell integrity. Bacteria were opsonized with 50% autologous normal human serum for 30 min at 37°C. Opsonized bacteria were washed with sterile Dulbecco’s PBS (DPBS, Sigma-Aldrich, St. Louis, MO) and resuspended in RPMI/H at a final concentration of 107 cells/ml. To determine whether LukGH primes neutrophils for enhanced bactericidal activity, PMNs (2 × 106 cells/ml; 500 μl in a 1.5-ml tube) were incubated with 0.1 or 1 nM LukGH for 30 min at 37°C. Bacteria were added at a multiplicity of infection of 1:1 to LukGH-pretreated neutrophils, and samples were incubated at 37°C with rotation for up to 2 h. In addition, we evaluated several permutations of our neutrophil bactericidal activity and LDH-release assays, such as varied bacteria/neutrophil ratios (0.1 and 10:1), survival of USA300 wild-type and isogenic ΔlukGH mutant strains, impact of calcium and magnesium, and differential effects of anticoagulants used in blood collection (EDTA versus heparin). None of these permutations had a significant impact on bacterial survival or LDH release. For assays that contained DNase I (STEMCELL Technologies, Vancouver, BC, Canada), the enzyme was added to the samples at a final concentration of 50 μg/ml prior to adding bacteria or 15 min before the 2-h time point. At 2 h, 25-μl aliquots of the assay contents were evaluated by light microscopy (cytospin followed by Wright–Giemsa stain), and the remaining sample was mixed with saponin on ice for 15 min, diluted, and plated on trypticase soy agar. CFU were enumerated on the following day and were used to determine the percentage of S. aureus survival relative to a time-matched control assay that did not contain PMNs. Phagocytosis assays were performed as described by Voyich et al. (17). To quantitate the percentage of PMNs with bound/ingested S. aureus, 50 PMNs (per blood donor) from different fields of view were scored for associated bacteria (includes bound and ingested). Lucigenin-ECL was used to measure neutrophil superoxide production (18). Assays were performed in white 96-well cell culture plates (Nunclon; Nunc, Roskilde, Denmark) coated with 20% human serum for 30 min at 37°C. A 100-μl aliquot of PMNs in RPMI/H (107 PMNs/ml) was added to each well, followed by the addition of LukGH (1 nM final concentration) or a mixture of LPS/LPB binding protein (LBP) (final concentration 100 ng/ml each; R&D Systems), and the assay was incubated at 37°C for 30 min. Plates were subsequently transferred to a Synergy Mx plate reader (BioTek, Winooski, VT) and lucigenin (bis-N-methylacridinium nitrate) or a mixture of lucigenin and fMLF (both from Sigma-Aldrich) was injected into the wells using an automated injector. Luminescence in each sample was recorded for 10 min with 24-s minimal intervals. Alternatively, superoxide production was measured by reduction of ferricytochrome c as described previously (13) with a few modifications. Freshly purified human PMNs (107 cells/ml) were incubated for 15 min at 37°C with 0.1 or 1 nM LukGH or a mixture of LPS/LBP (positive control), as described above. Subsequently, cells were added to a 96-well cell culture plate containing 100 μM ferricytochrome c with or without 1 μM fMLF and with or without 40 μg/ml superoxide dismutase (Sigma-Aldrich). Release of superoxide was monitored for 20 min using a SpectraMax 384 Plus microplate reader (Molecular Devices, Sunnyvale, CA). Surface expression of CD11b was assessed by flow cytometry (FACSCalibur; BD Bioscience, San Jose, CA), as described elsewhere (13). MPO assays were performed in 96-well cell culture plates (Costar, Corning, NY) coated with 20% pooled normal human sera. A total of 100 μl RPMI/H or media containing LukGH (final concentration 0.1 or 1 nM) was added to the wells, followed by 100 μl PMNs (107 cells/ml) or electropermeabilized PMNs (107 cells/ml). Plates were centrifuged at 450 × g for 7 min at 4°C and then incubated for 2 h at 37°C; 10 μl DNase I (50 μg/ml final concentration) was added to the appropriate wells during the last 15 min of incubation. At the time points indicated, plates were centrifuged at 450 × g and 4°C for 7 min. To quantify extracellular MPO, culture supernatants were diluted 1:200 with RPMI/H buffer, and MPO concentration was determined using an EnzChek MPO activity kit (Invitrogen/Life Technologies). Samples for immunofluorescence microscopy were prepared as described (19), but with the following modifications. Acid-washed cover slips were placed in wells of a 24-well tissue culture plate, coated with 100% pooled normal human serum, and incubated for ≥1 h at 37°C. Coverslips were washed with DPBS, and 300 μl 106 PMNs/ml was transferred to each well. PMNs or freshly electropermeabilized PMNs were incubated at room temperature for 15 min and then transferred on ice. PMNs were combined with RPMI/H or RPMI/H containing LukGH or PMA as indicated, and the cells were centrifuged at 450 × g at 4°C for 8 min, followed by incubation for 2 h at 37°C. Plates were placed on ice, and cells were washed with ice-cold DPBS. PMNs were fixed in 4% paraformaldehyde for 30 min on ice, followed by overnight blocking at 4°C in Stain Buffer with 2% FBS (BD Pharmingen, BD Bioscience). Cells were washed once and incubated with 2 μg/ml rabbit anti-histone 2A (Abcam, Cambridge, MA) and/or 1 μg/ml mouse anti-human MPO (BD Pharmingen) or 2 μg/ml rabbit anti-neutrophil elastase Ab (Abcam) in Stain Buffer (BD Pharmingen) at room temperature with gentle agitation. After a 90-min incubation, samples were washed three times with Stain Buffer and incubated for 1 h with secondary Ab (2 μg/ml goat anti-rabbit Ab conjugated with Alexa Fluor 594 or Alexa Fluor 488 [Jackson ImmunoResearch, West Grove, PA] and 2 μg/ml goat anti-mouse Ab conjugated with Alexa Fluor 488 [Molecular Probes/Life Technologies]). Coverslips were washed three times with DPBS and mounted on microscopy slides with Dapi-Fluoromount-G medium (Electron Microscopy Sciences, Hatfield, PA). Images were evaluated using a Zeiss 510 Meta scanning laser confocal microscope and LSM510 software version 4.2. The brightness and contrast of images were adjusted in Adobe Photoshop CS5 (Adobe Systems, San Jose, CA). Samples for scanning electron microscopy were prepared as described elsewhere (17) with the following modifications. PMNs (3 × 105) were seeded on 100% serum–coated silicon chips (Ted Pella, Redding, CA) contained in 24-well tissue culture plates. Cells were allowed to attach for 15 min at room temperature, followed by the addition of LukGH or PMA in RPMI/H medium, as indicated. RPMI/H medium only was added to the PMN control and electropermeabilized PMNs. Samples were incubated at 37°C with 5% CO2 for 30 min. At the time points indicated, cells were fixed and processed with microwave excitation. Sample chips were covered with ∼0.5 ml Karnovsky’s fixative and irradiated at 80 W for two cycles of 2 min on, 2 min off, and 2 min on in a Biowave model microwave processor equipped with a vacuum chamber and Cold-spot radiation attenuation system (Ted Pella). Following a 45-s wash in phosphate buffer at 80 W, the samples were postfixed in 1% osmium tetroxide and phosphate buffer with two cycles of 2 min on, 2 min off, and 2 min on. Samples were washed twice in water for 45 s at 80 W and dehydrated for 1 min each at 250 W in 70, 100, and 100% ethanol. The samples were critical-point dried through carbon dioxide, sputter coated with iridium in a model IBSe ion beam sputterer (South Bay Technologies, San Clemente, CA), and examined using a model S-8000 field emission scanning electron microscope (Hitachi High Technologies America, Schaumburg, IL). For transmission electron microscopy, cells were seeded on 13-mm serum-coated Thermanox cover slips (VWR, West Chester, PA) and treated as described above (except neutrophils were incubated for up to 4 h). Samples were processed further using low-power microwave irradiation, as described previously (20). Images were adjusted in Photoshop CS 5 (Adobe Systems) for contrast and brightness. Data were compared using one-way ANOVA and Tukey or Bonferroni posttest to correct for multiple comparisons (GraphPad Prism 5; GraphPad, San Diego CA), as indicated in the figure legends. We first assessed the effect of varied concentrations of LukGH purified from S. aureus culture supernatants on formation of PMN plasma membrane pores (Fig. 1A) and cytolytic capacity (Fig. 1B). LukGH-mediated PMN pore formation and cytolysis were concentration dependent (Fig. 1A, 1B). In addition, anti-LukH inhibited the ability of purified LukGH to form pores in the PMN plasma membrane and cause cytolysis, thus demonstrating that activity was specific to the leukocidin. LukGH-mediated PMN plasma membrane pore formation and cytolysis. (A) Pore formation. PMNs (1 × 106) were incubated with 0.1–5.0 nM LukGH or 5.0 nM heat-inactivated (h.i.) LukGH for 30 min, and plasma membrane permeability was evaluated using an ethidium bromide–uptake assay. Alternatively, LukGH was incubated with anti-LukH (αLukH) or IgG isotype-control Ab at the indicated concentrations for 15 min prior to combining with PMNs. (B) PMN lysis. PMNs (1 × 106) were incubated with LukGH, h.i. LukGH, and/or Ab, as described in (A), and lysis was determined by release of LDH, as described in Materials and Methods. The p values were calculated using one-way ANOVA and Tukey posttest. As a first step toward understanding the mechanism underlying the proinflammatory capacity of LukGH, we assessed the ability of the toxin to function as a neutrophil-priming agent. Priming of PMNs elicits granule exocytosis and, thereby, promotes enrichment of surface receptors, such as CD11b/CD18, at the plasma membrane (21). Thus, we tested the ability of 0.1 and 1 nM LukGH to upregulate expression of CD11b at the neutrophil surface (Fig. 2A). 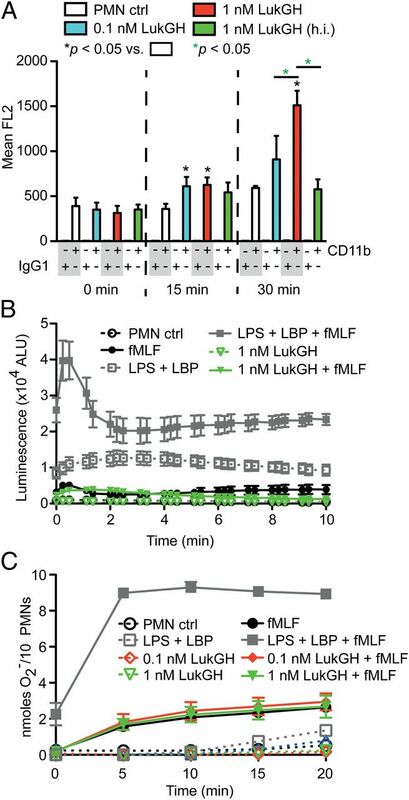 PMNs exposed to 0.1 or 1 nM LukGH had increased surface expression of CD11b: mean channel fluorescence (FL2) was 359.4 ± 56.4 and 610.4 ± 103.3 for control and PMNs treated with 0.1 nM LukGH for 15 min, respectively (p < 0.05). These results indicate that LukGH promotes fusion of secretory vesicles and/or specific granules with the plasma membrane and is consistent with the ability of known PMN-priming agents, including PVL, to upregulate PMN surface expression of CD11b (13, 22, 23). Inasmuch as the hallmark of PMN priming is enhanced release of O2−, we assayed LukGH-treated PMNs for increased superoxide anion production following secondary stimulation with fMLF (Fig. 2B, 2C). As evidenced by lucigenin-ECL assays, neutrophils incubated with 1 nM LukGH did not produce superoxide when challenged with fMLF as a secondary stimulus (Fig. 2B). Consistent with these observations, PMNs exposed to either 0.1 or 1.0 nM LukGH did not demonstrate fMLF-mediated release of O2− in ferricytochrome c–reduction assays (Fig. 2C). By contrast, PMNs primed with LPS (positive control for priming) showed markedly enhanced production of O2− in response to fMLF (Fig. 2B, 2C). 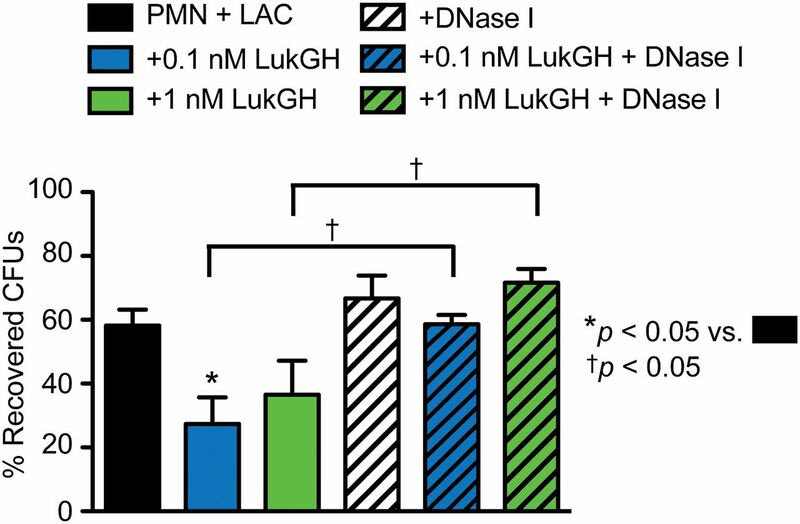 Although LukGH failed to prime neutrophils for enhanced O2− production, the finding that LukGH promoted increased CD11b surface expression lends to the possibility that PMN signal–transduction pathways unlinked to NADPH oxidase activity are altered. LukGH alters CD11b surface expression but fails to prime human PMNs for enhanced superoxide anion production. (A) Neutrophil surface expression of CD11b. PMNs were exposed to 0.1 nM LukGH, 1 nM LukGH, or 1 nM heat-inactivated (h.i.) LukGH for 30 min, and surface expression of CD11b was assessed by flow cytometry. Results are mean ± SE of three or four PMN donors. (B and C) Priming for PMN superoxide production. (B) PMN superoxide production was evaluated with lucigenin-ECL using the indicated stimuli. PMNs were incubated with 1 nM LukGH or 100 ng/ml LPS + LBP for 30 min and then activated with 1 μM fMLF for 10 min, as indicated. (C) Superoxide production, as assessed by reduction of ferricytochrome c. PMNs were incubated with 0.1 nM LukGH, 1 nM LukGH, and/or 100 ng/ml LPS + LBP for 15 min and then activated with 1 μM fMLF for 20 min. Results are the mean ± SE of three to seven experiments. The p values were calculated using one-way ANOVA and Bonferroni posttest. We next determined whether LukGH promotes enhanced PMN bactericidal activity against S. aureus (Fig. 3A). Compared with control assays, the number of S. aureus CFU recovered from assays in which PMNs were exposed to 0.1 or 1 nM LukGH were significantly reduced at 60 and 120 min: survival of USA300 was 110.2 ± 11.6 and 44.6 ± 10.1, respectively, for assays without LukGH compared with 63.1 ± 9.4 and 11.0 ± 2.3 for those containing 0.1 nM LukGH (p < 0.05) (Fig. 3A). Unexpectedly, and in contrast to previous findings with PVL-primed PMNs, the reduction in recovered S. aureus CFU from assays with LukGH-treated PMNs was not due to increased ingestion and/or binding of S. aureus (Fig. 3B, 3C). Collectively, these observations suggest that LukGH-enhanced PMN bactericidal activity is independent of NADPH oxidase–derived superoxide anion or there is aggregation of bacteria (and, thus, reduced CFU) by PMNs following treatment with LukGH. Impact of LukGH on PMN phagocytosis and bactericidal activity. (A) Bactericidal activity. PMNs were treated with 0.1 or 1 nM LukGH for 30 min and incubated with S. aureus strain USA300, and bactericidal activity was determined, as described in Materials and Methods. (B) PMN phagocytosis. PMN assays were performed as described in (A), and phagocytosis was determined at the indicated time points. (C) Association (bound + ingested) of bacteria with PMNs. Results are the mean ± SE of four or five experiments. The p values were calculated using one-way ANOVA and Tukey posttest. To further investigate the mechanism underlying the ability of LukGH to promote a reduction in the number of S. aureus CFU recovered from assays with human PMNs, we examined bacteria and PMNs from the bactericidal activity assays by standard light microscopy (Fig. 4). At 2 h following incubation, PMNs exposed to LukGH and challenged with S. aureus consistently showed evidence of concentration-dependent necrosis and/or clumping, whereas this effect was limited with control, untreated cells (Fig. 4A–C). Notably, cells exposed to LukGH often formed filamentous structures that resembled extracellular traps (Fig. 4D, 4E). By comparison, neutrophils failed to exhibit either phenotype in the absence of exogenous LukGH (Fig. 4A) or following the addition of DNase I to PMNs treated with LukGH (Fig. 4G, 4H). The finding that LukGH promoted the release of neutrophil DNA is consistent with the ability of the related S. aureus pore-forming toxin, PVL, to induce formation of neutrophil extracellular traps (NETs) (24). Inasmuch as LukGH enhanced neutrophil aggregation and induced formation of putative extracellular traps, we next modified the PMN bactericidal-activity assays to include DNase I digestion of extracellular DNA and assessed recovery of S. aureus CFU (Fig. 5). Compared with assays lacking DNase I, the number of recovered S. aureus CFU was significantly greater in assays containing LukGH and DNase I: survival of USA300 was 27.34 ± 8.4% and 58.66 ± 2.8% for cells exposed to 0.1 nM LukGH with or without DNase I, respectively (p < 0.05) (Fig. 5). By comparison, DNase I had no significant impact on the number of recovered S. aureus CFU from assays with PMNs alone. Moreover, the number of CFU recovered from PMN assays that contained LukGH and DNase I was not significantly different from those containing DNase I only: survival of USA300 was 58.66 ± 2.8% and 66.71 ± 7.2% with or without 0.1 nM LukGH, respectively (Fig. 5). These data provide support to the idea that extracellular DNA, released as a result of exposure to LukGH, promotes aggregation of PMNs and bacteria, and this phenomenon results in gross underestimation of CFU by the conventional bactericidal-activity assay (lacking DNase I). LukGH promotes extracellular release of neutrophil DNA. PMNs were incubated without (A, F) or with 0.1 nM (B, D, G) or 1 nM (C, E, H) LukGH for 30 min and combined with S. aureus strain USA300 at a ratio of 1:1 bacteria/PMN (A–H). (F–H) Alternatively, DNase I was added prior to addition of bacteria. PMNs and bacteria were cultured for 2 h at 37°C with gentle rotation. Samples were stained with a modified Wright–Giemsa stain and evaluated by light microscopy. Images were obtained using a 100× objective coupled with 4× digital magnification. Black arrowheads indicate neutrophils, red arrowheads indicate S. aureus strain USA300, and green arrowheads indicate extracellular DNA. Extracellular DNA (D, E) and clumping/necrosis (B, C) represent two distinct features of samples treated with LukGH. 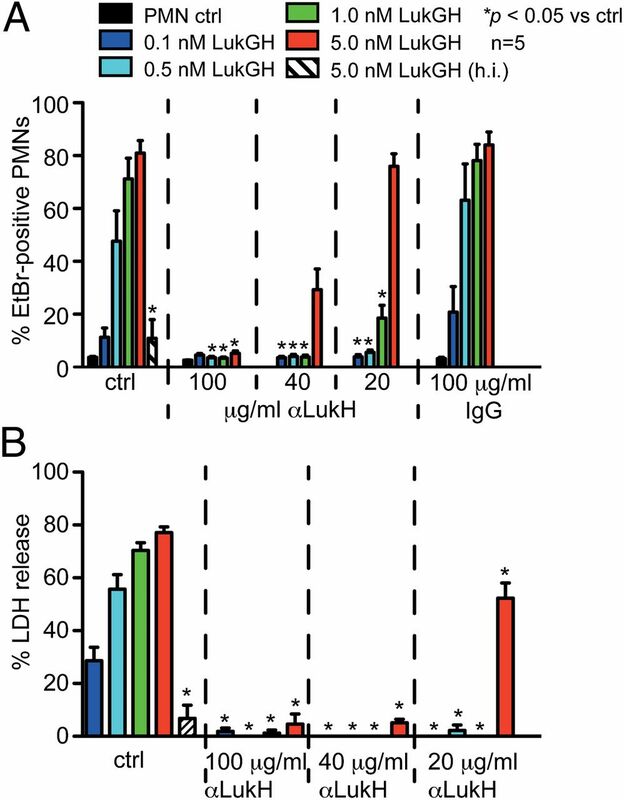 LukGH-induced NETs do not promote killing of S. aureus. PMN bactericidal activity. PMNs were pretreated with buffer, 0.1 nM LukGH, or 1 nM LukGH for 30 min, and bactericidal activity was assessed by determination of S. aureus CFU after 2 h of culture. DNase I was added to samples, as indicated, 15 min prior to termination of the assay. Results are the mean ± SE of three to five experiments. The p values were calculated using one-way ANOVA and Tukey posttest. Neutrophils were reported to release extracellular traps in response to S. aureus (25, 26) and the pore-forming toxin PVL (24). We performed immunofluorescence staining of PMNs following LukGH treatment to verify the presence of extracellular DNA, histone 2A, and MPO, known features of NETs (27). Indeed, we found that histones and MPO were associated with LukGH-induced NETs at 2 h, and the staining pattern was similar to PMNs exposed to PMA (used as a positive control for the formation of NETs) (Fig. 6). Moreover, the nucleus of the cells treated with LukGH underwent morphological changes characteristic of those reported for NETosis (Supplemental Fig. 1). Given that PVL (24) and LukGH each induce NETs, we tested whether nonspecific pore formation per se could induce NETs. Formation of PMN plasma membrane pores by electropermeabilization caused discrete pores in the plasma membrane without grossly disrupting cell architecture, as revealed by scanning electron microscopy (Supplemental Fig. 2). For example, exposure of neutrophils to 800 V at 25 μF promoted extensive NET formation, which was similar to that after exposure to PMA or LukGH (Fig. 6). We confirmed that PMNs treated with LukGH or those that were electropermeabilized maintained extracellular MPO enzymatic activity, which increased significantly following treatment with DNase I (Fig. 7), thus suggesting release of NET-bound MPO. These findings are consistent with a previous report that demonstrated that MPO activity is associated with NETs (28). Collectively, these data strongly suggest that, although LukGH promotes formation of NETs, shown in this study to be a characteristic common to nonspecific PMN damage, this process ensnares bacteria but does not enhance neutrophil microbicidal activity against S. aureus. Electropermeabilization of human PMNs promotes formation of NETs. PMNs were treated with 0.1 or 1 nM LukGH or were electropermeabilized using a pulse of 600 V at 10 μF or 800 V at 25 μF and were cultured for 2 h at 37°C. Alternatively, PMNs were treated with 40 nM PMA (positive control) to induce formation of NETs. Extracellular DNA was confirmed by immunofluorescence microscopy to be NETs by staining for histones (histone 2A; red), MPO (green), and DNA (DAPI; blue). Images were captured using a 63× objective coupled with 2.7× digital magnification. LukGH-induced NETs sequester MPO. PMN MPO activity assays. PMNs were treated with 0.1 or 1 nM LukGH, or cells were electropermeabilized and cultured for 2 h at 37°C. DNase I was added to samples, as indicated, 15 min prior to termination of the assay. NET-associated MPO was determined by chlorination (A) and peroxidase-activity (B) assays. The p values were calculated using one-way ANOVA and Tukey posttest. S. aureus two-component pore-forming toxins are a related group of secreted molecules that have potent cytolytic activity against host cells, most notably leukocytes. There are at least four S. aureus leukotoxins characterized with activity against PMNs: PVL, LukGH, leukotoxin DE, and γ-hemolysin. Inasmuch as neutrophils are the primary host defense against invading bacterial pathogens, significant emphasis has been placed on understanding the role of leukotoxins in S. aureus virulence and pathogenesis. Although progress has been made, the role of two-component cytolytic toxins in S. aureus pathogenesis is unclear, if not controversial (29–32). Furthermore, it was proposed recently that the presence of PVL can be beneficial to the host during infection, because sublytic concentrations of this leukocidin have the ability to prime human neutrophils for enhanced function and greater bactericidal activity (13, 32). Based on previous findings with LukGH, which includes the ability of the molecule to induce an inflammatory response in animal models (5, 33), we evaluated its ability to prime human PMNs for enhanced function. Although LukGH promoted increased surface expression of CD11b, a phenomenon characteristic of priming, the toxin failed to prime PMNs for enhanced superoxide production in response to a secondary stimulus. PMNs exposed to LukGH had a significantly altered surface morphology that was not necessarily a reflection of, or caused by, permeabilized plasma membrane (Supplemental Fig. 2). This change in PMN surface morphology was particularly evident at earlier time points after exposure to LukGH and apparently was not directly related to cell lysis (Supplemental Fig. 2). There also was noted donor-to-donor variability in the sensitivity of PMNs to LukGH-mediated membrane permeabilization and lysis. Such variability is perhaps explained by varied levels in surface receptor expression, because DuMont et al. (34) recently demonstrated that CD11b is a probable LukGH receptor, and there can be considerable variance in CD11b surface expression among human PMN donors. Despite differences in priming capacity between PVL and LukGH, each induces formation of NETs (24). NETs are DNA-based structures containing antibacterial proteins, such as elastase, cathepsin G, or MPO, which are typically contained within primary/azurophilic granules but are released during cell lysis and associate with NETs (Supplemental Fig. 3) (27, 28, 35). Induction of NETs by LukGH or PVL (24) (N. Malachowa, S.D. Kobayashi, F.R. DeLeo, unpublished observations) is time and concentration dependent. NETs originally were reported to have bactericidal activity (27, 35). However, our data (Fig. 5A) and those of other investigators (36, 37) suggest that NETs ensnare/trap bacteria rather than contribute directly to PMN bactericidal activity. Although LukGH failed to promote bactericidal activity directly, it is possible that trapping of bacteria by NETs promotes enhanced clearance of the pathogen in vivo. Indeed, it is known that molecules from lysed neutrophils, including during NET formation, attract other professional phagocytes, such as macrophages (38, 39), which could expedite clearance of bacteria. In contrast, formation of NETs and associated PMN lysis have potential negative outcomes for the host, including nonspecific damage to host tissues, and contribute to autoimmune disorders or vascular dysfunction (40, 41). For example, McDonald et al. (25) demonstrated recently that NETs entrap bacteria during blood stream infections, a process that could be beneficial for the host, despite concomitant host organ damage (42). These data are consistent with our previous studies (5), in which we found decreased survival of mice infected with a USA300 isogenic ΔlukGH/Δpvl deletion mutant strain compared with the wild-type USA300 strain. Despite recent progress toward our understanding of the role of PVL and LukGH during S. aureus–host interactions, further studies are needed to elucidate detailed mechanisms underlying the enhanced host response to infection mediated by these interesting molecules. On a final note, we found that formation of NETs can occur as a consequence of nonspecific physical damage to the neutrophil plasma membrane (Supplemental Fig. 2). The implication of these findings is that NETs can form simply from nonspecific PMN lysis that is not dependent on specific signal-transduction events. We thank Rocky Mountain Laboratories National Institute of Allergy and Infectious Diseases colleagues Anita Mora for photography and Kevin Braughton for technical assistance. This work was supported by the Intramural Research Program of the National Institute of Allergy and Infectious Diseases, National Institutes of Health. RPMI 1640 medium buffered with 10 mM HEPES.
. 2012. Staphylococcus aureus hemolysins, bi-component leukocidins, and cytolytic peptides: a redundant arsenal of membrane-damaging virulence factors? Front Cell Infect Microbiol 2: 12 .
. 1995. Panton-Valentine leucocidin and gamma-hemolysin from Staphylococcus aureus ATCC 49775 are encoded by distinct genetic loci and have different biological activities. Infect. Immun. 63: 4121–4129.
. 2010. Staphylococcus aureus panton-valentine leukocidin is a very potent cytotoxic factor for human neutrophils. PLoS Pathog. 6: e1000715.
. 2012. Staphylococcus aureus leucocidin ED contributes to systemic infection by targeting neutrophils and promoting bacterial growth in vivo. Mol. Microbiol. 83: 423–435.
. 2012. Staphylococcus aureus leukotoxin GH promotes inflammation. J. Infect. Dis. 206: 1185–1193.
. 2011. Characterization of a new cytotoxin that contributes to Staphylococcus aureus pathogenesis. Mol. Microbiol. 79: 814–825.
. 2010. Relative contribution of Panton-Valentine leukocidin to PMN plasma membrane permeability and lysis caused by USA300 and USA400 culture supernatants. Microbes Infect. 12: 446–456.
. 2008. Panton-Valentine leukocidin is expressed at toxic levels in human skin abscesses. Clin. Microbiol. Infect. 14: 1180–1183.
. 1994. Interaction of the two components of leukocidin from Staphylococcus aureus with human polymorphonuclear leukocyte membranes: sequential binding and subsequent activation. Infect. Immun. 62: 3184–3188.
. 1994. Activation of human effector cells by different bacterial toxins (leukocidin, alveolysin, and erythrogenic toxin A): generation of interleukin-8. Infect. Immun. 62: 4831–4837.
. 1995. Effects of Staphylococcus aureus leukocidins on inflammatory mediator release from human granulocytes. J. Infect. Dis. 171: 607–613.
. 1994. Leukotriene B4 generation and DNA fragmentation induced by leukocidin from Staphylococcus aureus: protective role of granulocyte-macrophage colony-stimulating factor (GM-CSF) and G-CSF for human neutrophils. Infect. Immun. 62: 2529–2535.
. 2012. Sublytic concentrations of Staphylococcus aureus Panton-Valentine leukocidin alter human PMN gene expression and enhance bactericidal capacity. J. Leukoc. Biol. 92: 361–374.
. 2002. Global changes in gene expression by human polymorphonuclear leukocytes during receptor-mediated phagocytosis: cell fate is regulated at the level of gene expression. Proc. Natl. Acad. Sci. USA 99: 6901–6906.
. 2004. Neutralization of Staphylococcus aureus Panton Valentine leukocidin by intravenous immunoglobulin in vitro. J. Infect. Dis. 189: 346–353.
. 2006. Is Panton-Valentine leukocidin the major virulence determinant in community-associated methicillin-resistant Staphylococcus aureus disease? J. Infect. Dis. 194: 1761–1770.
. 2005. Insights into mechanisms used by Staphylococcus aureus to avoid destruction by human neutrophils. J. Immunol. 175: 3907–3919.
. 2006. Basis for the failure of Francisella tularensis lipopolysaccharide to prime human polymorphonuclear leukocytes. Infect. Immun. 74: 3277–3284.
. 2003. Bacterial pathogens modulate an apoptosis differentiation program in human neutrophils. Proc. Natl. Acad. Sci. USA 100: 10948–10953.
. 2010. Coxiella burnetii phase I and II variants replicate with similar kinetics in degradative phagolysosome-like compartments of human macrophages. Infect. Immun. 78: 3465–3474.
. 1998. Neutrophils exposed to bacterial lipopolysaccharide upregulate NADPH oxidase assembly. J. Clin. Invest. 101: 455–463.
. 1996. Priming differentially regulates neutrophil adhesion molecule expression/function. Immunology 89: 105–111.
. 1994. Lipopolysaccharide enhances CD11b/CD18 function but inhibits neutrophil aggregation. Blood 83: 3303–3311.
. 2012. 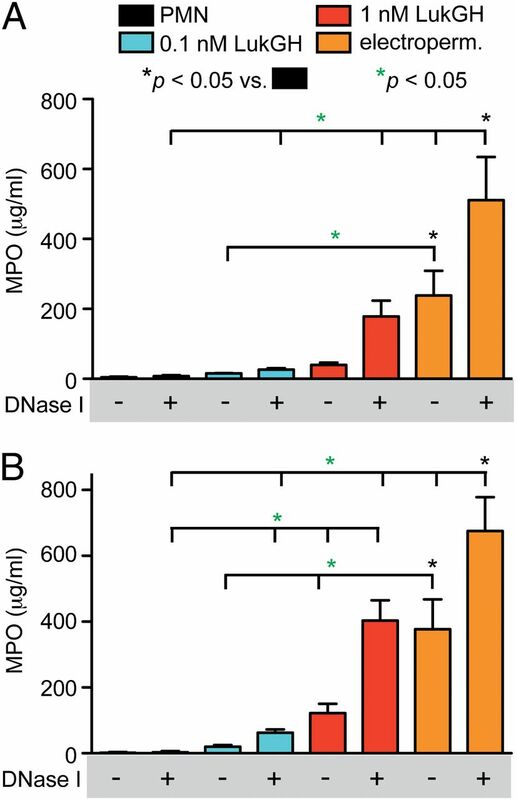 Myeloperoxidase associated with neutrophil extracellular traps is active and mediates bacterial killing in the presence of hydrogen peroxide. J. Leukoc. Biol. 91: 369–376.
. 2007. In vitro production of panton-valentine leukocidin among strains of methicillin-resistant Staphylococcus aureus causing diverse infections. Clin. Infect. Dis. 45: 1550–1558.
. 1999. Involvement of Panton-Valentine leukocidin-producing Staphylococcus aureus in primary skin infections and pneumonia. Clin. Infect. Dis. 29: 1128–1132. 2009. Presence of genes encoding the panton-valentine leukocidin exotoxin is not the primary determinant of outcome in patients with complicated skin and skin structure infections due to methicillin-resistant Staphylococcus aureus: results of a multinational trial. J. Clin. Microbiol. 47: 3952–3957.
. 2010. Antibody-mediated enhancement of community-acquired methicillin-resistant Staphylococcus aureus infection. Proc. Natl. Acad. Sci. USA 107: 2241–2246.
. 2010. Identification of a novel Staphylococcus aureus two-component leukotoxin using cell surface proteomics. PLoS ONE 5: e11634. DuMont, A. L., P. Yoong, C. J. Day, F. Alonzo, W. H. McDonald, M. P. Jennings, and V. J. Torres. 2013. Staphylococcus aureus LukAB cytotoxin kills human neutrophils by targeting the CD11b subunit of the integrin Mac-1. Proc. Natl. Acad. Sci. USA 110: 10794–10799.
. 2010. Mannheimia haemolytica and its leukotoxin cause neutrophil extracellular trap formation by bovine neutrophils. Infect. Immun. 78: 4454–4466.
. 2012. Killing by neutrophil extracellular traps: fact or folklore? Blood 119: 1214–1216.
. 2013. 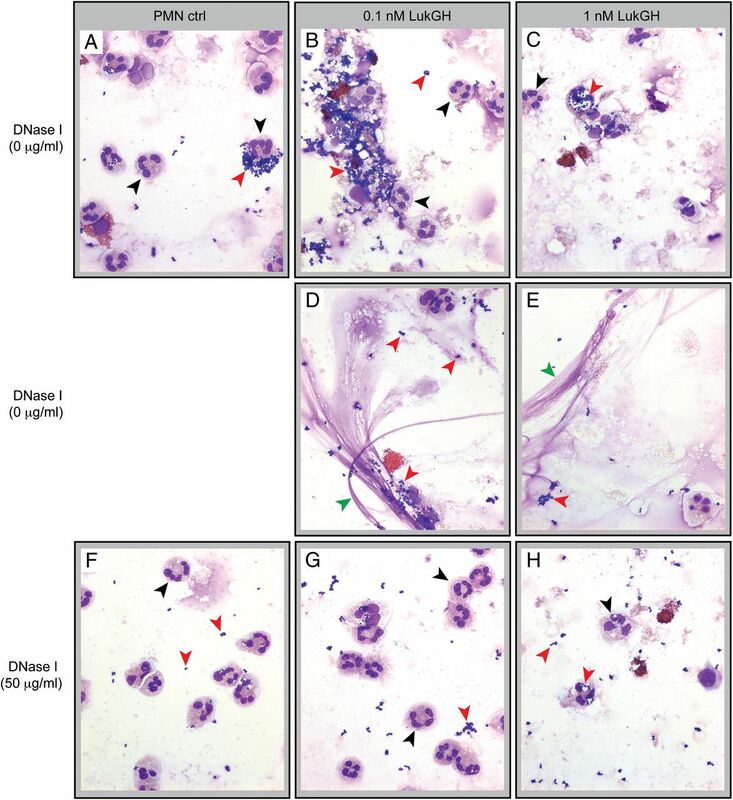 Mycobacterium tuberculosis-induced neutrophil extracellular traps activate human macrophages. J. Innate Immun. .
. 2007. The humoral pattern recognition receptor PTX3 is stored in neutrophil granules and localizes in extracellular traps. J. Exp. Med. 204: 793–804.
. 2012. Neutrophil extracellular traps (NETs) and infection-related vascular dysfunction. Blood Rev. 26: 255–259.
. 2012. Neutrophil extracellular traps: double-edged swords of innate immunity. J. Immunol. 189: 2689–2695.
. 2012. Depletion of neutrophil extracellular traps in vivo results in hypersusceptibility to polymicrobial sepsis in mice. Crit. Care 16: R137.